There are a lot of fancy schmancy recipes for salmon, but simple pan searing is tough to beat – it’s fast, easy and anybody can do it well indoors or out on the grill. Pan searing is quick, easy and one of the best way to cook salmon. Wild Alaska Salmon is generally considered the finest option – Coho are the mildest, King are the richest and Sockeye is the most flavorful. Much of the wild Alaska Salmon we buy comes from Dennis Zadra, come along fishing with him in this short video. Other great choices include our organic Shetland Island Scottish salmon (very rich and mild tasting) as well as Steelhead and Arctic Char. Our fisherman on the Copper River goes to great lengths to assure his fishes get to us in peak condition. My first choice is a 12-inch DuBuyer steel skillet (available at Sur la Table) or a well-seasoned Lodge Cast Iron skillet (Army Surplus). I also love the way my Calphalon stick free skillet sears fish (available everywhere). It’s important to start with the biggest and heaviest pan possible because a large heavy pan holds lots of heat, necessary for quick browning, and if the fish doesn’t brown quickly, it’ll be overcooked before it’s nicely seared. 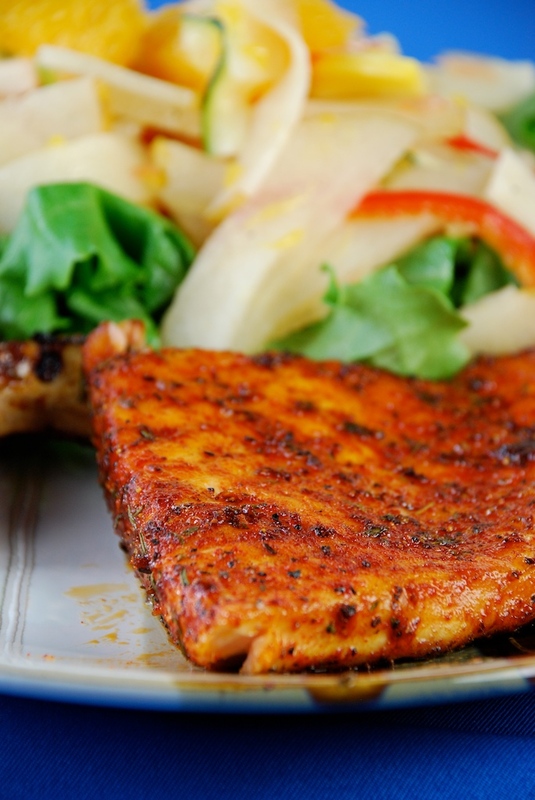 Get all your side dishes ready, salmon cooks pretty quickly. Preheat the pan well over medium to medium-high heat (don’t heat over high and turn down – always preheat at the temperature you plan to cook). I use a laser thermometer to test the pan temp to about 360-380° for salmon (available at auto parts or hardware stores). You can also just use common sense, swirl the pan with oil and when the oil shimmers, it’s time to add the fish. If the pan is not nice and hot, the fish will be done before it browns. The larger and heavier the pan the better, holding more heat for quick recovery and superior searing. Seasoning or marinating for 1-2 hour before cooking is recommended. I suggest any of our House Marinades pictured below and am also quite fond of seasonings that are sweet and/or spicy such as our Tony’s Sweet Salmon Rub, Bangkok Thai (spicy), Harissa Spice (spicy) or Taste of Tokyo Rub. Tony’s House Marinades, great on fish, pork, poultry or beef. Fishes have bands of short-twitch muscles which cook much faster than most land animals; so the keep them as cold as possible and add them to a hot pan for the best browning possible – otherwise they can end up overcooked before the outside is nice and brown. I am also a big fan of the seared salmon skin so I like to scale mine before cooking – this can be done with the tines of a fork under running water, but if you plan to do it often, I suggest a scaling tool. Once your pan is hot, add oil and place fillets in the pan skin side up, this assures the best browning on the side that will be shown off on your plate. I like to leave the skin on, not only does it taste delicious seared, it holds the delicate and flaky filet together when removing from the pan or grill. If you don’t choose to serve the skin, you can use a spatula to lift the meat away from the skin, one or two times and you’ll have it mastered. Choose great salmon fillets and have your butcher assure there are no pin bones. If you like to eat the skin, scale first. Sprinkle fillets with seasoning to taste and keep very cold until ready to use. Preheat a large, heavy skillet over medium to high heat – ideally heating to 360-380 degrees F.
Add oil, swirl and add seasoned salmon fillets skin side up. Sear quickly to brown, shaking pan a time or two to keep fillets from sticking. After 3-4 minutes, turn and cook skin side down for 3-4 minutes longer – cooking rare to medium to taste (about 120-150° internal). Note: Actual cooking time depends on the conditions. The sweeter the seasoning, the faster it will brown. This recipe is also great on the grill – preheat, clean grates and oil immediately before adding the fish. Sauces: Serve with a sauce that compliments the seasoning you’ve chosen – suggestions: Tony’s Mango Salsa, gremolata, white wine or mushroom sauce, herbed butter, fruit chutney and sweet glazes. Wine: Match your wine to your seasoning and/or serving sauce. If it is sweet or spicy, I strongly suggest Riesling or Gewürztraminer. Other great choices include a crisp white, anything sparkling or a fruity pinot noir.